Sometimes one must get away from the salons of London’s great houses. Elegant Lansdowne with her sculpture and paintings. The convivial meals at Holland House. Even the bohemian conversation at No. 10 St. James. Let us repair to the country just outside the metropolis and follow in the footsteps of Constable and Coleridge. To the northern end of Hampstead Heath and a creation in the highest order of Palladian design. To Kenwood House, I say. 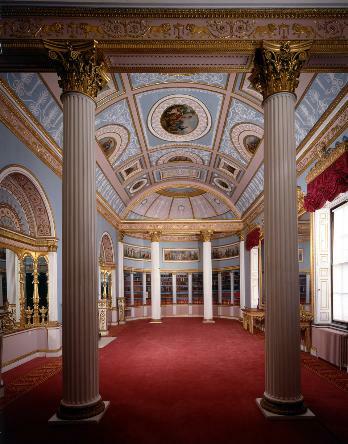 Purchased by Baron Mansfield in 1754, Kenwood House was remodelled by Robert Adam, and contains one of the finest libraries that master artist had ever designed. It was a fitting residence for the baron, even more so when he was raised to an earldom in 1776. In that year, his nephew married the third of seven daughters sired by Lord Cathcart (try saying that nine times). Louisa (1758 – 1843) would soon be in a position to do a service for the earl. His lordship had it in his mind to bequeath Kenwood and his earldom to David, but at the time there was a strong aversion to passing an English peerage to a Scot. Thus, the earldom of Mansfield seemed destined to end. Happily, Lord Mansfield was Chief Justice of the King’s Bench and a rather clever lawyer. The earl cast his eye over his nephew’s pretty wife. No Scot was she. So he devised a special remainder to his own title so that it could pass to her upon his death and save the earldom for the family. Louisa became a countess in her own right. 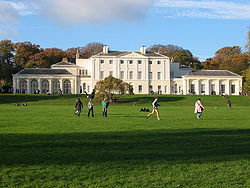 But her real value lay in being hostess at Kenwood, happy to receive the weary tourist to Hampstead Heath. She was also a Patroness of Almack’s, hostess to the weary debutante. Altogether Her Ladyship was a rather accomodating person. This entry was posted in Regency, Uncategorized and tagged Almacks, Caen Wood, Earl of Mansfield, Hampstead Heath, Highgate, Kenwood House, Lord Cathcart, Louisa, Robert Adam, Viscountess Stormont by Angelyn. Bookmark the permalink. What a gorgeous house. Very like what I pictured for my hero’s Palladian estate in my novella. I’m also a sucker for libraries. Thanks, Ally–an Adam design is easy to recognize and appreciate. Lovely post on a beautiful estate.